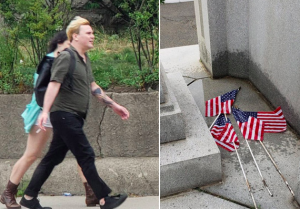 Massachusetts cops are hunting for a man they say urinated on several American flags at a veterans cemetery — after an “outraged” witness posted pictures of the vile act. George Gatteny, of Somerville, said he spotted the suspect among a group of people Sunday at a World War II memorial in the Somerville Veterans Cemetery. A woman with the man acted as a lookout while he relieved himself, only stopping when Gatteny yelled at him, he said.